It’s marketing 101—[Vodafone New Zealand] seem to breach the rules quite regularly and you’d have to hope that these signiﬁcant ﬁnes are a signal to them that they can’t continue to do that. It’s from Sue Chetwin, CEO, Consumer New Zealand, on how Vodafone is cavalier about staying within the letter of the law in the Fair Trading Act. And it is the principle: because since 2006, I have not been a Vodafone customer. And since 2009, one of my companies has not been a Vodafone customer. In fact, since March 2009, I have no ties with Vodafone whatsoever, either personally or as a director of a company that uses Vodafone. On the same invoice is an ‘Opening balance from last statement’ for $4·21, which they debited from my credit card on February 25, 2011. But that time, I received no invoice—they just went ahead and did it. When I called Vodafone, I was told that the charges were made on a calling card that was still valid. Problem: I have never had a calling card with Vodafone. And now, today, they revealed that they took $24 in 2010. But as Vodafone is guilty of 21 breaches of consumer law in a July case alone—and was found guilty of misleading customers over Vodafone Live and its $1 a day services the year before—you can summarize that something is very rotten there. I’d swore I’d never go back—nek minnit, they’ve acquired TelstraClear. Oligopoly much? At Vodafone’s request via Twitter, I have emailed them the following. It does contain the usual pleasantries at the beginning and the end, omitted here for brevity. This summarizes the entire case so far. This is further to SS’s request on Twitter that I send you these details. I will note that two customer services’ officers on the call care centre have also been investigating. Attached you’ll find a bill that I was sent via email on September 7. You’ll see it’s for 22¢, and that in April 2011, another $4 was debited from my credit card. A phone call to Vodafone today revealed that over $20 was taken in 2010. The problem with all of this is that I have not been a Vodafone customer since March 2009. If you want to split hairs, I actually haven’t been one since 2006, I believe, but one of my companies was between 2006 and 2009. • Became an Ihug customer in 1998, but left Ihug for Saturn in 2000. I kept some toll calls with Ihug but switched back to TelstraClear some time during that decade. Your records show the account was closed in 2006—although I was also told a contradictory statement that the account was not closed. • Lucire Ltd. was a Vodafone customer on a three-year contract between March 2006 and March 2009. I am a director of that company. Here’s what I understand from Vodafone (gleaned from conversations on September 8, 9 [I think] and 29). I was promised a refund of the $4 in one of the early September phone calls. My credit card statement shows no such refund. I have confirmed that the credit card details you hold are correct. Worryingly, they are also current—which they cannot be if I left you in 2009 and my credit card originally expired that year. I also began receiving spam from you this week for a cellphone number that was with you, but has not been with you since 2009. • I’ve never received a single invoice from you for the money you’ve taken—at least not till September 7, 2012. So I’m pretty sure you know that I’m not a customer of yours. Now, I’m willing to take my share of the blame. I should be reading every line of my credit card statement. But, I’d also like you guys to refund what you’ve charged since I ceased being a customer. There’s also the buggy Air New Zealand site where they shifted the blame to me for not clearing the cookies or understanding how the back end of their website works, but I’ll leave that for another day. What they didn’t figure was my taking screen shots of what I did. I enjoyed the bit about your having taken screen shots – that does tend to change their response a little doesn’t it ! 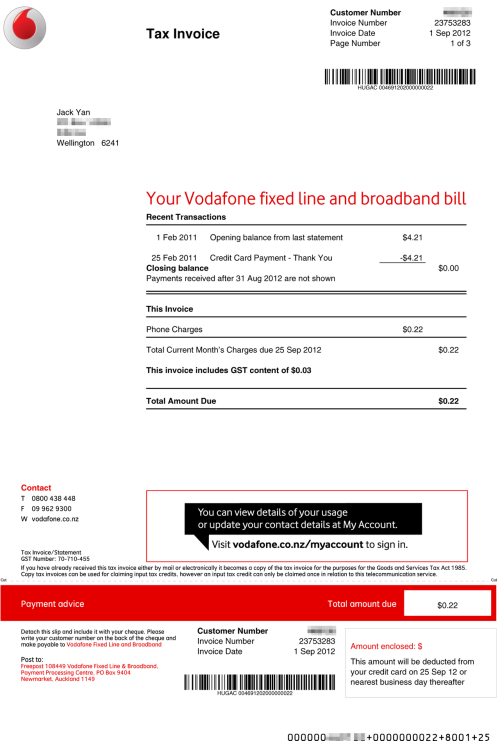 By the way, for what it’s worth, on at least one occasion in the last six months my wife and I have failed to receive an emailed Vodafone invoice. I’d say that process wasn’t all it could be and probably someone in VF knows that. Your experience of them updating your credit card details themselves makes me think of an idea I think would be a good one. A credit card supplier provides you with a CC and allows you to generate ‘virtual credit card numbers’ which bill to the master account. You give each virtual number to one supplier only. No more “oh please cancel my auto-payment” nonsense; you just go into your account and delete that virtual credit card ! I won’t hold my breath on seeing the innovative side of the banking industry adopt that one ! Richard, that’s an excellent idea and I agree: we’d be waiting a long time for the banking industry to adopt something for the customer’s benefit! I have a suspicion that the Vodafone email system is faulty at best. What gets me is that I never opted for emailed invoices, so the fact they claim to have sent all of those since May 2009 remains very suspicious. The change to email without request, and not notifying the customers of those emails, still looks like a way to conceal billing.